On this date in 1441, a Westminster folk magician went to the stake. The “Witch of Eye” had meddled with powers beyond her control — not the Satanic for which her sentence condemned her, but those of the royal court. This local wise woman had been arrested as a sorceress once a number of years before. But medieval Europe, before the Reformation and Counter-Reformation and the attendant gloom of existential danger from within, was usually not eager to pursue a local shaman for serving a community’s demand for everyday magick — just so long as the charms and incantations purveyed were not being turned to any apparently injurious purpose. The Witch of Eye, Margery Jourdemayne by name, spent several months imprisoned in Windsor Castle and was released with a pledge to stop with the hocus-pocus. In her fatal last affair this broken promise would augur very ill. But barring that extraordinary case, this was actually one of those little social regulations that could usually just be ignored in the breach. Our cowherd’s wife returned to purveying salves, potions, and elixirs, perhaps a bit more quietly. Despite her humble rank, the Witch of Eye seems to have enjoyed a sizable client base among the great lords and ladies. Such august persons of course had interests outside of love tonics. At the start of the 1440s, the royal court was absorbed by the affairs of the teenage king Henry VI. In Late June of 1441, three servants of Eleanor, Duchess of Gloucester were accused of compassing the death of the king by using astrological divination to forecast the date of his death — which looked especially treasonable since the result reported is supposed to have been soon. Though a Peerress by marriage, Eleanor was only the daughter of a knight. A sort of proto-Anne Boleyn, she had raised herself (and not a few eyebrows) by starting off as a lady in waiting of the Duke’s previous wife, and (once dynastic machinations sent that Duchess packing for her native Low Countries) advancing herself into the master’s bed. And this same tyme was take a womman callid the wicche of Eye, whoos sorcerie and wicchecraft the said dame Alienore hadde longe tyme usid; and be suche medicines and drynkis as the said wicche made, the said Alienore enforced theforsaid duke of Gloucestre to love her and to wedde her. The rank of the figures involved elevated such gossip beyond the court’s everyday palaver. Humphrey had claimed the Regency for a brief period before Henry VI declared his own majority in 1437, at age 16. More than that, Humphrey was the most senior uncle to the unmarried* Henry, which made him the heir presumptive. He was a heartbeat away from having the crown on his own head. Henry’s alarmed response was twofold. First, he commissioned a horoscope reading of his own; no surprise, this improved horoscope predicted a long, healthy life.† Second, he kicked off the judicial processes that would ruin all concerned — although some ruinations were more final than others. The servants pointed the finger at Eleanor, and the Duchess desperately fled to the sanctuary of Westminster Abbey. This proved not to help her that much when an ecclesiastical court handed down charges of witchcraft and heresy. One of Eleanor’s three busted cronies, Roger Bolingbroke, had already been forced to publicly abjure his devilries amid a display of his necromancing tools. Just as Bolingbroke claimed that “he wroughte the said nygromancie atte stiryng of the forsaid dame Alienore, to knowe what sholde falle of hir and to what astat she sholde come,” Eleanor implicated her old magic-vendor, the Witch of Eye for building some of the illicit charms. By now it was pratically beside the point that Eleanor said Bolingbroke’s damning wax figurines were meant to inflict children upon Eleanor rather than injury upon His Majesty. Margery Jourdemayne had shaped the wretched dolls, and nobody caught in the storm of charges had less pull than she. Plus, of course, she was now a repeat offender. So should his life consume away unfelt. Condemned by a court presided by the Archbishop of Canterbury, she was burned at Smithfield. Two of the three courtiers died violently, too: Roger Bolingbroke was hanged, drawn, and quartered on November 18, while Thomas Southwell died suddenly in prison around the time of Jourdemayne’s execution. He might have poisoned himself. The third man, John Home, was only shown to have known what his fellows were up to and not to have taken part himself: he skated on a royal pardon. The Duchess of Gloucester did well to confine her own juridical guilt to ecclesiastical charges only — heresy and witchcraft — and beat the much more dangerous treason charge that was leveled at her. (In another century, Britons would be much more used to the idea of executing elite nobility.) Her marriage was annulled (she procured it by witchcraft, remember?) and she was forced to perform a humiliating, Cersei Lannister-like‡ public penance on foot around Westminster and London before being shunted off into a forced and closely-watched retirement. The scandal didn’t directly touch the Duke of Gloucester, but it essentially forced him out of public life. Six years later he was arrested for treason, but he died (possibly of a stroke, or possibly poison) within days. The verses excerpted above in this post come from the following century’s “Mirror for Magistrates”, which makes use of historical figures who met terrible fates not unlike this very site. She might also have helped inspire a lost play from the late 16th or the 17th century. Shakespeare too stages this entire affair in Henry VI, Part 2, representing Gloucester as an innocent tragically bearing the disaster his enemies visit on him through his wife. In Act I, Scene 2, Eleanor arranges her divination — and we learn that her enemies are in the process of framing her. Eleanor. While Gloucester bears this base and humble mind. To play my part in Fortune’s pageant. We are alone; here’s none but thee and I.
Eleanor. What say’st thou? majesty! I am but grace. Your grace’s title shall be multiplied. We’ll see these things effected to the full. Marry, and shall. But how now, Sir John Hume! Yet am I Suffolk and the cardinal’s broker. To call them both a pair of crafty knaves. But the entire party is arrested and Gloucester’s attempts to note the meaningless vagueness of the predictions supplied by the alleged demon are overruled abruptly. 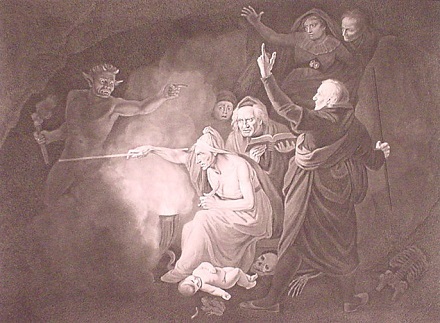 The conjuration scene in Henry VI, Part 2, illustrated by John Opie. In Act II, Scene 3 the Duke and Duchess are destroyed politically, and their hirelings destroyed bodily. Such as by God’s book are adjudged to death. Sorrow would solace and mine age would ease. God and King Henry govern England’s realm. Give up your staff, sir, and the king his realm. As others would ambitiously receive it. His lady banish’d, and a limb lopp’d off. Where it best fits to be, in Henry’s hand. Thus Eleanor’s pride dies in her youngest days. See also: Jessica Freeman, “Sorcery at Court and Manor: Margery Jourdemayne, the Witch of Eye Next Westminster,” Journal of Medieval History, vol. 30, pp. 343-357. * Henry married Margaret of Anjou in 1445. Despite the Shakespeare portrayal, she had no part in the proceedings against Eleanor or the Witch of Eye. ** It has long been supposed that part or all of the real impetus for these charges was an opportunistic attack by the Duke’s political rivals, specifically around the question of making peace with France in the Hundred Years’ War. Gloucester, who fought at Agincourt (Shakespeare’s Henry V name-checks him in the great Crispin’s Day pre-battle oration), opposed the growing pro-peace faction. † It did not predict that Henry would end up murdered in prison. ‡ Game of Thrones author George R.R. 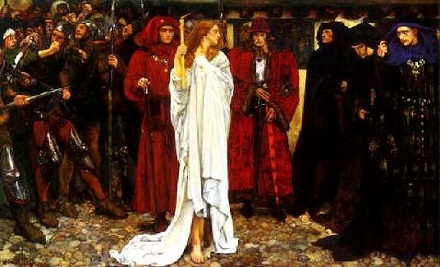 Martin unquestionably mines historical atrocities for inspiration and the notorious Walk of Shame scene is no exception; however, the specific public penance he’s cited as the fountainhead for Cersei’s ritual humiliation was not Lady Gloucester’s, but a similar walk endured some years afterward by Edward IV mistress Jane Shore, for which affair we may digressively endorse this History of England podcast episode. 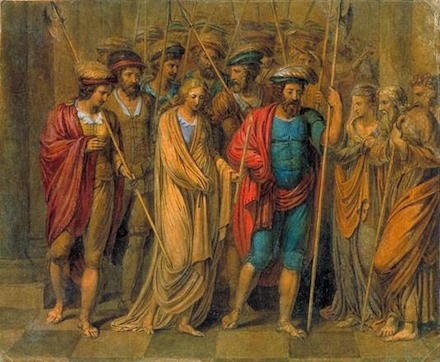 The Penance of Jane Shore, by William Blake (1780).